Pull the navel both up and back to reduce the strain on the discs in the lower back. 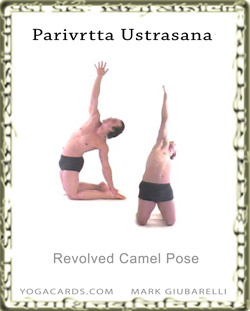 Make sure the lower back have been warmed up before performing this pose deeply. Raise one arm up while keeping the other arm down. This will cause the body to twist. Align the shoulders vertically. Place something under the knees like a blanket or towel. This will reduce strain on the knees caused by the weight of the body. Try placing the support under the knees on top of the tibia bone. This can reduce the pressure on the knees completely. These techniques may be necessary if the knees are sensitive or don’t feel healthy with weight on them. For an easy variation take you hand to the mat instead of on the foot and allow the pelvis to come down a little. This will increase the bend in the knees a little. Placing it on the inside of the leg will increase the twist and placing it on the outside of the foot will reduce the twist. These types of twists can be done mildly for safety. Reducing the curvature of the spine not only reduces the chance of back aggravation or injury but also increases some of the therapeutic and rehabilitative values of performing this pose. The deep versions are quite hard.